The question on my mind today is: who supports the workies sides in senior football (that referring to Saturday afternoon sides in the football pyramid, not old guys trapping a ball with their zimmer frame on the local Rec)? Vauxhall Motors have had considerable success in the last few years, even defeating Queens Park Rangers in an FA Cup 1st Round replay at Loftus Road on penalties a couple of seasons back. All clubs pray for these days as a financial boost and also to create awareness in the local area but nonetheless to what do Vauxhall FC fans align themselves? They can’t possibly all just be Vauxhall workers, surely? Usually when you support a club, there is a pivotal moment where you fall in love with it as representing your hometown (or a relatives hometown), issues of geographical, personal and familial identity abounding. This pivotal moment can concern a club with no personal connection to yourself though, and just be a result of a team, or a single player, capturing your imagination in some way. That’s why I followed Southampton for so long despite being a Portsmouth resident – you can blame Peter Shilton for that. Perhaps therefore the QPR games did just that for some of the faithful here but I doubt their gates have rocketed since then and they certainly aren’t stellar now. I felt like going around asking fans about their VM connection but my inherent shyness, plus the fact that a chap going round saying ‘Do you work here? Mmm? MMM?’ would probably be expected to follow that up with ‘No? Well then could you vacate the premises’, warned me off. Furthermore, who PLAYS for the workies sides in senior football? To compete at this level it is difficult to limit yourselves to players from the county, let alone the town your team represents (and some say this is making non-league football edge towards the professional game in terms of football clubs and local identity), so working from the sign-up sheet in the rest room would be nigh on impossible. That said, I like the idea of Vauxhall Motors boss Owen Brown pulling a scratch XI from the canteen queue, but it is fanciful. Apparently though, the Metropolitan Police side that remains with their heads above water in Ryman League Division One South (2 leagues away from Conference South) IS still made up of jobbing filth. Again, who watches? Off duty officers? Elderly couples still in love with the notion of the upstanding boys in blue (and white at away games)? I personally think it’s ex-cons lapping up the delicious irony of coppers tackling blokes and then getting cautioned themselves. Portsmouth Royal Navy FC certainly used to be all sailors which made for a very transient squad (any port in a relegation battle) and have changed their name and raison d’etre to ‘United Services Portsmouth’ to help avoid a matchday panic in the dockyard and blokes forcibly removed from their messes and thrown into a kit. They languish in the lower echelons of the Wessex League. Tis hardly surprising. I will return to this subject in a week or two as a game I have pinpointed as a potential will give yet another example of this. 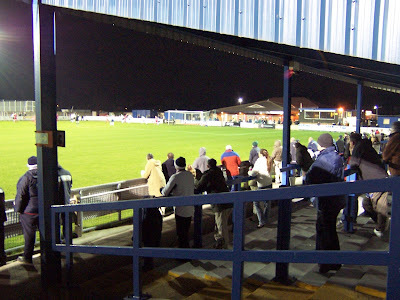 Certainly though, it seems bizarre that ANYONE should end up at Rivacre Road to watch Vauxhall Motors, as even though they are vaguely associated with Ellesmere Port, they are well outside it in the middle of fackin’ nowhere, which decimates your potential walk-up audience. Walk-up I must though, as I ‘as no wheels. Nor do I want wheels, but they may have been handy tonight, as the walk from the station is about a mile and a half – no problem to this ol’ stroller – but some of it was through unlit woodland (on a proper road I grant you, but still a little unsettling, especially as I’d come prepared by wearing all-black). Drivers en route to the game must have been quite surprised to come upon me. Being a Sports and Social, it is part of a complex with a good sized drinker and some plastic five-a-side pitches attached. As you might expect though there are few features in the ground apart from a small plot of covered terracing mirroring an equally small stand on the opposite side. 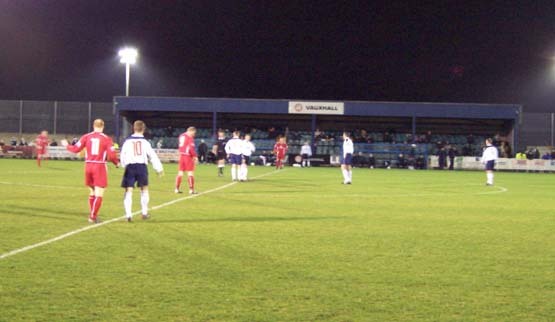 At the back of the terracing is a touching tribute plaque, still surrounded by flowers, to Mark Pearson, the Vauxhall midfielder who collapsed in a game against Northwich Victoria in 1999, and later died, aged 34. Needless to say, I hope he continues to rest in peace. The ground has been left behind in the wake of their meteoric recent success under Alvin Macdonald and I doubt it would qualify for the Conference National, but I doubt that is on the agenda. Vauxhall, like Crewe on Saturday, are punching above their weight and are probably more than happy with that. Macdonald left the club and since then taken charge of Runcorn FC Halton, today’s opponents, and hence the reason I picked out this game, plus the fact it’s bit of a South Wirral local derby, but Macdonald has recently been removed from the Runcorn hot seat. Ah well. 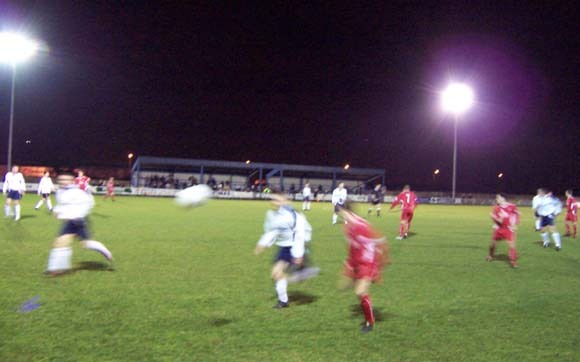 The first half is interrupted half way through thanks to floodlight failure but we’re back into it after 15 minutes by which time Runcorn appear to have found their hunger, while Vauxhall’s Motors are still left back in the garage (had to be done). They find themselves 2 goals up with the minimum of fuss thanks to their use of the flanks, causing Vauxhall all sorts of trouble with their pass and move dynamics. The Motormen go from 0-60 in the 15 minutes of the break and go for it hell for leather in the second period (or is it third after the bulb blackout?) and eventually and deservedly pull one back. They continue to pile on the pressure but, having used all 3 subs, the departure of their striker, seemingly nicknamed ‘Spud’, on a stretcher puts paid to any hopes of salvaging something from the game. So Vauxhall remain in contention for relegation, and Runcorn are far from safe, both in terms of Conf. North status, and also for their future as a club, as the rent money for their tenancy at Widnes Rugby League’s Halton Stadium is proving hard to come by. Here’s hoping they can find somewhere suitable back in Runcorn, to take them home, back south of the Mersey.